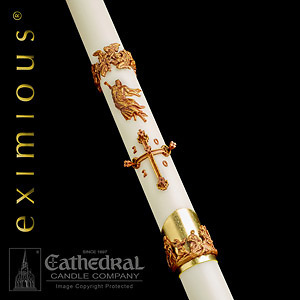 Cathedral Eximious Mount Olivet Paschal Candle 2-1/4" - 48"
Every Eximious candle from Cathedral is individually hand-made in the USA with intricate inlays, rich onlays, and classic sculptured engravings. Available in lengths ranging from 39" to 62" and diameters from 1-15/16" to 4". Allow four weeks for delivery. Due to the made-to-order nature of this product it is non-returnable unless the product is defective.